Episode 024 of the Ideas Architect Podcast. For most businesses, marketing is listed as an expense in the profit and loss statement. In this podcast episode we discuss four key principles for flipping this on it’s head and turn your marketing expenses into a new income stream. This is how you can get paid to promote yourself. 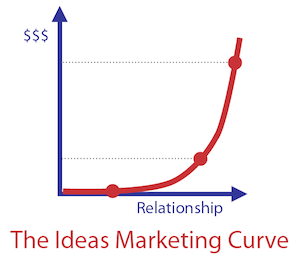 It’s the holy grail of marketing and more achievable than you might think. To follow along with this Promote Yourself Podcast Episode, watch the ‘Get Paid to Promote Yourself’ slides or download them. The Lifetime Value of Your Customers is often used to justify the cost of marketing. Is this a false presumption? To get paid to promote yourself we consider alternatives. We discuss the merits of free products and fee earning products to promote yourself. Are your products lazy and shy? This may be the key difference between selling a few products versus creating a stampede of buyers. The easiest product in the world to create and promote yourself. Are books dying? We look at the big reason that books are not being read and reflect on the limitations of writing and publishing a book. Why building an app may be better to promote yourself than writing a book. The masterstroke of design that propelled the Apple iPod to be the coolest product on the planet. How to use your diary to promote yourself. What do sunglasses, t-shirts and hummers have in common? And, why you should employ this secret in your marketing efforts. How leaf-blowers sell themselves and how to use this strategy to promote yourself.